Note: the roles of the different regions described below have been simplified here for understanding. The connections between and roles of these regions are a lot more multifaceted and studies are being done to fully understand each of these regions. The ventromedial prefrontal cortex (vmPFC – also referred to as the orbitofrontal cortex) is a brain region thought to underlie our decision-making. Clues that the vmPFC may underlie decision-making came from patients with vmPFC lesions. These patients demonstrate changes in how they make decisions. For example, an individual with an intact vmPFC often weighs different outcomes prior to making a decision. This person would likely favor rewarding outcomes while avoiding punishing outcomes while keeping future consequences in mind. For example, this person might say no to too much candy (an instant reward) to stay healthy. A patient with vmPFC lesions however often demonstrates insensitivity to punishment and future consequences while constantly seeking immediate rewards as reported in this study. Another evidence for the involvement of the vmPFC in decision-making comes from functional magnetic resonance imaging (fMRI) studies. fMRI is a neuroimaging technique that measures blood-oxygen level dependent (BOLD) signals that correlate with neuronal activity in a given brain region. Changes in BOLD signals in a brain region during a specific task often suggest that that region may be involved in said task. 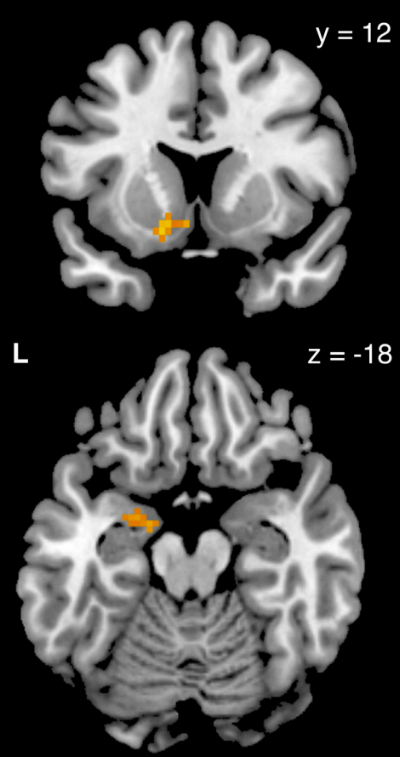 The BOLD signal of the vmPFC often correlates with reward-guided decision making. Together, the lesion studies and fMRI studies point to the vmPFC as being a decision-making region. So now that we have a decision-making brain region, lets look at what helps it ‘decide’. Just thinking about my own decision-making I can say that there are at least two factors that matter: 1) Which choice is best for me? 2) How am I feeling when I decide? Applying this to a neuronal level, one can imagine that the decision-maker (vmPFC) must be getting inputs from at least the reward center (striatum) and the emotional center (amygdala). Studies (both lesion and neuroimaging) do indeed show links between the striatum and amygdala with the vmPFC. Another critical brain region that influences decisions is the dorsolateral prefrontal cortex (dlPFC). This brain region is critical because it serves as the practical/logical center in decision-making. The dlPFC is thought to incorporate past experiences and weigh the pros and cons during decision-making. For example, when you are sad, you may want to eat that whole tub of ice cream. The dlPFC will serve to integrate the immediate reward of having ice cream with the potential health benefits so your vmPFC will make the decision to eat a little less of the ice cream. Together, these different centers, the striatum, amygdala and dlPFC, are thought to influence the vmPFC’s decision-making. So now, what does stress do? A number of studies have been done to investigate the relationship between stress and decision-making (reviewed in Starcke and Brand, 2012). In most of these cases, stress seems to be correlated with poorer or riskier decision-making. A recent study demonstrates that there is indeed a neurobiological correlate to these previous observations. The authors use an established task where human participants are made to choose between the healthier but less tasty food (think cauliflower) and the tastier but less healthy food (think donuts) while under acute stress (participants were made to submerge their hand in ice cold water for about 3 minutes – sounds pretty stressful, at least to the hand). The authors showed that stressed participants were more likely to go for the tastier but less healthy option relative to non-stressed participants. These results are not too surprising given that the majority of us are probably all too familiar with “stress eating” during finals week. To evaluate how stress changes the brain’s decision-making circuitry the authors use fMRI to measure activity in the brain during the task described. Interestingly, the authors do not see a difference in the vmPFC between stressed and non-stressed participants. However, stressed participants show a correlative increase in activity in the amygdala and striatum. Stressed patients also had stronger connectivity between the amygdala and striatum and the vmPFC while the connectivity strength between the dlPFC and the vmPFC is reduced (the connectivity strength between different brain regions was measured using psychophysiological interaction analysis – a way to measure the statistical dependence in activity between two regions). It is important to note that the connectivity strength changes and the behavioral changes observed are only correlated. We cannot yet say that these connectivity changes causes a stressed person to make the unhealthy choice. At present, there is some evidence suggesting that stress and the stress hormone, cortisol can alter the activity and signaling of regions such as the amygdala (Jasinska et al. 2012). Nevertheless, further analysis (likely using model organisms) is necessary for us to understand whether and how stress changes the strength of these connections and what that means for decision-making. The field of decision-making is still in its early stages. While many regions of the brain that represent different aspects of and inputs to decision-making have been identified, it is becoming more and more apparent that understanding decision-making would require an analysis of not just these different regions but also how they are connected. This will certainly be a challenge for scientists as decision-making involves so many components like reward, emotion, past experience and even logic. It will be interesting to see how these different components are coded and weighed against each other and how these codes and weights are altered as new information and experiences come in. This field of decision-making is certainly an exciting one as these studies offer a way for us to start connecting mind (decisions) to matter (neurons). Starke, K., Brand, M. (2012) Decision making under stress: a selective review. Neurosci Biobehav Rev.